A survey was given to 1,000 middle school students across the United States, asking them to choose their favorite subject in school. The results of the survey are below, with each subject followed by the number of degrees composing that subject's sector in the circle graph displaying this data. What percent of students prefer a subject that is not Music, Art or PE? First, add together the degrees of the sectors representing Math, English, Science and Social Studies. Reference a map of major cities on the West Coast to help you with this question! A survey was given to fans throughout the West Coast, asking them who their favorite team was. The results are below with the team name and the degrees making up the sector representing that team in a circle graph that displayed this data. What percent of fans prefere Team A, C, or D? First add together the degrees from the sectors representing Teams A, C, and D.
A pie chart depicts the favorite beverages of high schoolers. Below is the data with the beverage and the number of degrees making up that beverage's sector. What percent of high schoolers prefer a beverage that was not specifically listed as a choice? First add together the known sectors. Use that sum (350 degrees) and subtract from the total number of degrees in a circle (360 degrees). A circle graph displays data of the eye colors of a group of middle schoolers. The data is shown below with the eye color followed by the number of degrees composing that sector. What percent of students have brown eyes? In the above diagram, is an equilateral triangle. 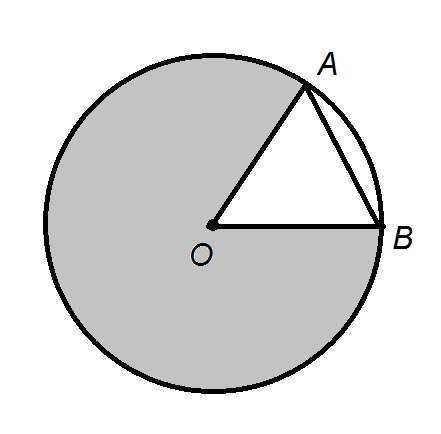 What percent of the circle has been shaded in?